Following the hugely disappointing news that Cineworld, Picturehouse and Curzon Cinemas have effectively boycotted the release of The Hateful Eight altogether, Edinburgh’s Filmhouse has announced that it will be the second cinema in the country to screen the film in 70mm, following its exclusive four-week run at Odeon Leicester Square in London. Premiering Fri 12 Feb and running to Thu 25 Feb, Edinburgh cinephiles get the privilege of seeing the first new film to be projected in Ultra Panavision 70mm in half a century, on the only print available in the UK. The 70mm Roadshow version of The Hateful Eight will be the only place film fans can view an extra 20 minutes of unseen footage, with the 187-minute extended cut film featuring an intermission and even a rare, exclusive overture by legendary composer Ennio Morricone (Once Upon A Time, A Fistful of Dollars). 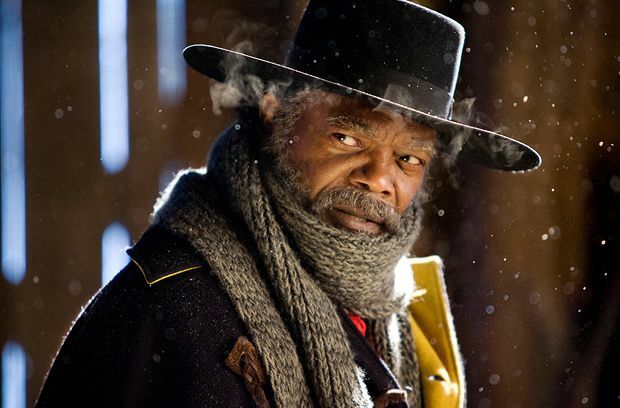 Written and directed by Tarantino, his eighth feature film, The Hateful Eight stars Samuel L Jackon, Kurt Russell and Tim Roth as part of a typically stellar ensemble set in post-Civil War Wyoming as eight strangers seek shelter from a deadly snow storm. With a high value bounty in their midst, carnage is almost certain to ensue. The news of Filmhouse's scoop offers hope to film fans around the country that Edinburgh won’t be the last stop in the print's journey. The List has been tracking this story for some time, and as soon as we know more about where else the film is playing in 70mm, we’ll be sure to share it with you. Tickets are available now to see The Hateful Eight in 70mm at the Filmhouse, as well as digital screenings from Fri 8–Thu 28 Jan.